A typically quiet Sunday morning in the office region of this eastern metropolis was barely pricked by the shrill cheers of a smattering of fans, whistling and shouting as the members of the Indian team went out and returned from the nets in preparation for the second Test against the West Indies at Eden Gardens. The Indian Olympic Association (IOA) today described as correct the decision taken by the International Hockey Federation (FIH) to hold the Olympic hockey qualifier tournament in Delhi as per schedule. "The FIH decision vindicates the IOA stand that the event should not be moved out," IOA acting president Vijay Kumar Malhotra said. Darren Sammy may not be the best cricketer, or captain, in the business, but one cannot help but admire his human side. At one go, he encompassed the sorrow of losing people he knew and also managed to laugh when asked how to stop VVS Laxman from scoring. The local style of kabaddi, known as the Circle Style, has become really popular throughout Punjab with many players and the Punjab Government spending large sums of money on the promotion of this game. But it has yet to make it to the list of recognised games of the Indian Olympic Association. Rohan Bopanna Aisam-ul-Haq Qureshi won their first ever ATP Masters tournament after whipping away the challenge of Julien Benneteau and Nicolas Mahut in straight sets in the Paris Masters final here today. The seventh seeded Indo-Pak pair took just 65 minutes to defeat the French wild cards entries 6-2, 6-4 and pocket their third title of the season. McLaren's Lewis Hamilton won the floodlit Abu Dhabi Grand Prix on Sunday after Red Bull's double Formula One champion Sebastian Vettel suffered his first race retirement in more than a year. Hamilton, celebrating the third win of a troubled season for the 2008 champion, enjoyed a clean race to take the chequered flag 8.4 seconds ahead of Ferrari's Fernando Alonso with McLaren team mate Jenson Button a distant third. Action on day four of the All India Inter-University Archery Championship, underway at Punjabi University, Patiala, continued with some power-packed performances in both individual and team Olympic rounds. In the recurve round individual event, Avinash Kumar from VBS Purvanchal bagged gold medal. The noise was dwarfed also by the giant 85,000-capacity concrete and steel fortress, but seemed to match the surround as Virender Sehwag walked back, waving his bat to practically every one of this little group. The man seemed to be in a good mood. Not the same can be said of the Indian batting in general. Eden, it seems, is headed the Kotla way, when it comes to pitches. At least the practice pitches did little to cheer anyone and the local curator’s claims of a full-length match, though welcome, are debatable. One is never really sure of how a pitch behaves. Indicators are by and large the tracks parallel to the one prepared for the match and those were not very encouraging. Even the fastest Indian bowlers found it a struggle to really get something out of the track, while West Indies skipper Darren Sammy once again came up with his typically philosophical shrug when asked if he would ever get a bouncy track in India. Given that the last Test played here, against South Africa in February 2010, saw 1229 runs being scored for the loss of 26 wickets, it seems quite surprising that the track has become a cause for concern. But this is cricket in India. Everything goes nowadays. All that having been said, the West Indies bowling hasn’t done badly at all. Given that they don’t always radiate confidence as a unit, they managed to really dent the Indians in a manic second-day afternoon at New Delhi and it took some poor batting on the visitors’ part and some serious application from India’s much higher-rated batsmen to actually keep the sanity and gap between the sides alive. The West Indies’ problem really is their batting. Several times over the past few years they have managed to consign themselves to defeats from positions of strength, including Kotla. So there is where they will have to find some new mantra. 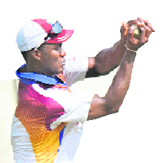 The bowling will almost surely see some changes, with Sammy indicating that a less-than-impressive Ravi Rampaul may make way for off-spinner Shane Shillingford, who had come in for grief in late 2010 for is action, before being cleared in June 2011. Such is the fate of West Indies cricket today that medium-pacers are making way for dodgy offies. India on the other hand, are not required to think in terms of changes. If the track is any indication, they are pretty much exactly where they want to be and in any case it would take some serious snags to change a winning side. Both spinners, Pragyan Ojha and Ravichandran Ashwin, will be keen to have a go, though the latter would be a tad distracted for sure. 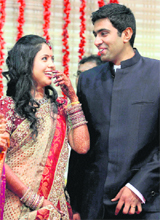 It isn’t easy getting married in the morning, rushing off to another city in the afternoon and playing a Test match next morning. The batting story seems to be same too. Sehwag is his nonchalant whistling self, waving at crowds. He isn’t much bothered with the pitch - he never is. For the rest, including a certain Sachin Tendulkar, here is one more stage for that big one. But if he gets his 100th century here, it will be quite an achievement, not just in terms of a record, but also as a tribute to his technique, temperament and patience on this pitch. The FIH Executive Board had unanimously decided yesterday to conduct the qualifiers and other major hockey tournaments allotted in India in the country itself, instead of pulling them out, as it had done in the case of the Champions Trophy. It had also decided to recognise Hockey India (HI) as the National federation of the sport. A decision to this effect was conveyed to Sports Minister Ajay Maken by FIH President Leandro Negre over phone from Lausanne, Switzerland. The FIH after shifting the Champions Trophy from Delhi to Auckland had also threatened India with severe consequences, including debarring participation in the Olympics, if the Sports Ministry continued its existing arrangement of recognising a unified ad-hoc committee to run the game here. "The IOA had told FIH president Leandro Negre during his visit to Delhi in early October that despite the fall in ranking, India remains the nerve centre of world hockey and had urged him not to shift the Champions Trophy," Malhotra stated today. He said he had also informed Negre that the IOA too did not accept two federations for one game and recognised only HI’s right to conduct the game. “I am happy that the FIH has now come out with a correct decision recognizing India as a hockey hub and accepted the IOA stand,” Malhotra added and said shifting out the Champions Trophy had affected the national team’s preparations for the London Olympics but “it also did not do any good to the game per se”. “IOA is fully committed to the Olympic Charter, we will never accept two federations for any sport, that is our unequivocal stand, which the FIH has also accepted,” he said. Malhotra also cautioned the FIH that in case of any dispute, it should deal with the NOCs and in India's case, it was the IOA and no other authority. "Otherwise, it would be a violation of the Olympic charter," he noted. Maken had also expressed satisfaction at the FIH decision and termed it as a "suitable and logical conclusion" to the efforts made by the ministry and Hockey India as indeed the FIH. The presence of HI secretary-general Narinder Batra and vice-president Rajeev Mehta for the FIH Executive Board meeting helped tilt the FIH decision in India's favour. Though Punjab has recognised the game and also given jobs to all players who were a part of the Indian squad that won the first Kabaddi World Cup, no efforts have yet been made to actually get the game recognised in the country so that it would benefit more players. Coaches and players feel that if the Punjab Government was taking so much pain in promoting this style, it should also ensure that the game is recognised by IOA so that the players could get jobs, not just in Punjab but any part of the country and also, their efforts are recognised at national level. Interestingly, while the players taking part in the World Cup were awarded cash prizes worth lakhs, the marks for their performance were not even included for MAKA Trophy. Sources in the Association of Indian Universities (AIU) said that though the universities had presented their stake for the inclusion of marks from these games, the scrutiny committee did not include Punjab-style kabaddi as it was not a recognised sport in India. President of the Punjab Olympic Association, Sukhdev Singh Dhindsa, said that after the Punjab Government recognised the game, they were planning to propose the recognition of this game in IOA. But then things were messed up due to the Commonwealth controversy. “As soon as the things get settled in IOA, we will send a proposal for getting Circle-Style kabaddi recognised because this game is played in various countries and is very popular. A large number of players are seeking careers in this game. So, I don’t see a reason why this should not be recognised,” he added. Seconding his opinion, Mangat Singh Mangi, former captain of the Indian team under whose leadership India won the first Kabaddi Cup, said though the Circle-Style kabaddi was not very popular earlier, it has become one of the most sought after sports in many countries. They had won the Gerry Weber Open at Halle and the Stockholm Open before this event. 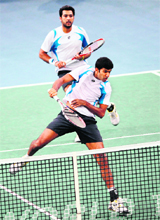 Bopanna and Qureshi, who have already qualified for the season finale in London, earned 1000 ranking points each and split euro 134,500 as prize money. Bopanna and Qureshi created chances in a jiffy and broke their rivals in the third and fifth games to open up a comprehensive 4-1 lead in the opening set within 20 minutes into the match. Twice they were down 0-30 but did not lose control over the set and comfortably sealed it. “Mega job, mega job guys - as usual,” whooped Hamilton over the team radio, dedicating the victory to his watching mother Carmen as a birthday present. Vettel, who has already clinched this year's title, was pitched off by a puncture at turn two of the opening lap after making a clean start from his record-equalling 14th pole of the season. The 24-year-old German managed to nurse his Red Bull back to the garage on three tyres and a rim but he was forced to retire once mechanics had surveyed the damage. 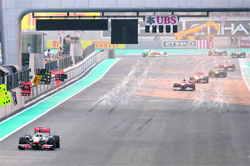 The retirement ended Vettel's hopes of matching Michael Schumacher's record of 13 wins in a single season as well as a hat-trick of Abu Dhabi wins. He currently has 11 wins from 2011 with only the Brazilian Grand Prix remaining. It also ended a run of seven podiums and 19 successive points finishes stretching back to last season. While Vettel was left as a spectator on an evening without a Red Bull driver on the podium for the first time this year, Hamilton drove a controlled and self-assured race that lap by lap lifted his spirits as day turned to night. While Alonso led for a couple of laps before his final stop, the Spaniard came out of the pits 4.4 seconds behind the McLaren. There was no doubting Hamilton's happiness as he gave Alonso, his former team mate and foe who had sung his praises earlier in the weekend, a friendly hug on the podium and waved to the crowd as Button doused him with fizzy rosewater. "I'm ecstatic, very happy to be back up here," he told reporters of his return to the top of the podium after a series of crashes and controversies. "It's early days yet but this is definitely a start of something hopefully very good." Button's third place, secured on the penultimate lap when Red Bull's Mark Webber had to pit for a mandatory switch to hard tyres, ended a difficult afternoon for the 2009 champion whose KERS system failed early on. In the women’s section compound round individual event, P Lily Chanu fom Punjabi University defeated Anjali from GND University and entered the finals. In the other semifinal, Satyapriya Devi from Punjabi University defeated Ramandeep Kaur of the same university to set title clash with Lily.